It’s been 15 years since the terrorist attacks of September 11, 2001, but I can still remember exactly where I was and what I was doing that day. I was in the office, sitting at my desk when I heard that a plane had crashed into one of the Twin Towers of the World Trade Center. Assuming it was an accident, that first news did not give any indication as to what was really happening. It wasn’t until the second plane hit the second tower that we knew this was something much more significant. The situation continued escalating when we heard about another plane hitting the Pentagon. And as video of the planes and the damage started coming in along with sketchy news about a possible fourth plane, we started to sense the magnitude of the situation. 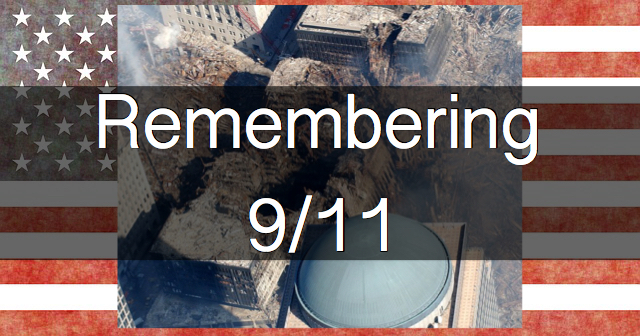 As the first tower collapsed, we already knew that we were witnessing one of the worst tragedies in American history. The days after the attacks were chaotic. Friends and colleagues trapped around the world due to the disruption in air travel. Stock markets in turmoil. And dealing with the realization of what had happened. We watched in horror as crews continued to pull body after body from the rubble and the death toll continued to rise. It tore your heart apart watching the interviews of families who had lost loved ones. Men, women, children – wealthy, poor – first-responders. The devastation didn’t care who you were, where you came from, or how much money you made. The events of 9/11 forever changed this country. They changed me as well. On a business trip to NYC a few weeks prior to 9/11, I had visited the Twin Towers area. I remember looking up in awe at the magnificent structures. A few months following the disaster, I was again in NYC for business. I arrived at my hotel very late and walked into the room. Upon opening the drapes, I had to stop and catch my breath. Directly across the street was the vacant lot that had once been home to the Twin Towers. The area was lit up with spotlights and all you could focus on was the vast emptiness of the ground that once supported the largest buildings in the world. These moments have remained with me all these years later. They help serve as a reminder not just of the tragedy, but also of the resilience of this nation and of people around the world. And in spite of the challenges and turmoil we see today, I know that we will find common ground and move forward to become a better, stronger, and even greater country again. I really appreciate this post FS, both as your tribute to the victims and also an insight into what it was like. I was in primary school when it happened (both age wise and physically) so I didn’t really understand what happened, nor know much what actually happened so I couldn’t really imagine what it was like. I hope we never have to experience anything like that again. 9/11 was such a tragic time that I only learned about after coming to the United States. Great post dedicating to those who had to witness and endure firsthand what had actually happened.